As a graphic designer, there is an importance in examining the application of print and typography today and in contrast to traditional craft. By examining the craft and material elements of design you better the ability to reinforce and add substance to your communication. How can we use the craft of typography and print design to reinforce and add substance to communication? Create a publication that serves as an expression of the identity of the Ravensbourne Advertising and Brand Design degree show. The audience for this project, Design practitioners. Those who create and those who study. This should aim to educate, express and add substance to the identity of the course. For this project, I was being mentored by Sam Blunden a London based designer and art director. As well as working alongside Michel Bailey, Charlie Baker and Tayo Onabule, working on the identity for the degree show. The first task for this project was to pitch some initial ideas for the publication to the team. So for this, I began gathering research material and inspiration from studios I admire as well looked through a few books that I had or had been given for this project. From this putting images of the layouts, bookbinding techniques and covers that I thought would well for the project into a presentation. I then began to start looking at typeface that I could use for the book. I came across The Good Type Foundry, that had a few typefaces that would work nicely with the art style I was trying to achieve. Such as good sans and Adieu. Both sans-serif font but they both had their own unique features. Once I had collected my research. I had a meeting with the others in which we both pitched to our client, our course leader and Sam. In this meeting, we discussed the overall art direction of the project. As the publication would sit alongside the identity we had to agree on no something that would work digitally and on print. The team working on the identity had disused 'a route around 3 main attributes to the course. Encapsulates, diversity and perspective. Creating a layered visual language that utilises a future-facing 3D approach featuring element of traditional graphic design that scales effectively across digital and print.' The feeling around this was that stylistically this felt right but the meaning was wrong. The direction needs to convey the tag line of the course - ‘Trust the journey’. So we spoke about making some sort of fluid connecting link between the A to BD. Conveying the 'Jonrey'. But, realised this was too similar to last year D&AD identity. So the identity team were then tasked trying to find a solution to this. In the meantime, I and Sam begin to discuss book product. The first thing we need to work out was a structure for the book. I had been provided text, so I printed that out and started to highlight the different sections. Referencing those notes to produce an initial flat plan. To produce a flat plan I need to decide on a format for the book so I started looking at the books I had collected as research and tried to find a size that felt about right. A key consideration for this was I didn’t want anything too cumbersome as this publication would be displayed at the degree show. From past experience, you don’t want anything that you can’t read with one hand. So I started with the quarto (241x305mm) from this crating a 96-page flat plan and started to mark it out for where the content needs to be. Now that I had an initial flat plan I started to do some test layouts with the typeface I had chosen. Being, Good Sans. Bellow are a couple of initial layout designs. Whiles doing this I started to gather the content fo the student section for the book ‘class of 2019’. For this, I sent out an email to all students with the spec of what I wanted from them for the book. Asking for a selection of images from their best project from their time on the course. Witch, I could then pick the best image from to display on their page in the book. Then I set up a spreadsheet wherein which they could capture there; name, email, website, one liner and role for the project. Witch I could then use for the credit device under each of their images. This ended up being a lot more time-consuming at first thought. Even with such a clear structure in place. Which is a shame as I could have spent more time work on the artworking but instead I had to send numerous amount of email to students to collect the content. Once I had most of the content. I printed a full-scale version of the flat plan to put on a wall. As well as printing a picture of each student and the copy and stuck them to the pages. This helps massively with getting students to get there content to together as they had a visual and helped me to see where I had too many pages and how to break up the book. As well as seeing what was missing. The next stage was to get the scheme for the book ready so I could start working. So I went to Sam’s studio to get everything proofed and disusee the next stage. In this meeting, we went over the initial layout schemes that I had designed. Going through each scheme and marking what worked and what didn't. We also began to look at a grid system. As so far we didn't feel that there was much of structure, We also thought the page dimension felt a bit wide. So we sat down and disused a new structure being 165x240mm which was slightly narrower than the last format. Now that we had the size we worked that it would divide well into units of 8. With the rule, I created a grid both 4x4 and 5x5 key considerations for there were that we need space for the seam and for the page number/ name device in the margins of the grid. So I decided on the margin of 8/8/12/12mm. The as I was working in units of 8 I made the gutter 4. Unfortunately, a 5x5 didn't work for this I stuck to the 4x4. I then went on the make the layout scheme fit this. I had disused with Sam how to brake the book up into 4-5 schemes. Being essay, industry partnerships, Instagram, class of 2019 and end matter. So I began to make schemes for each of these. Spread across 3 columns with the 4th left for credit. 2 column or same as 'essay'. 2 col with 2-3 images per page. Full spread image with description and credits same as 'essay'. With the schemes in place, I had them proof again by Sam and he marked out the changes I needed to make. One of the things he picked up on was the font chose. Originally we were going to run with Good san. But, we both agreed that it was too heavy for body text. So we look at some other fonts Visuelt and Basis Grotesque. I then took the essay scheme and printed both fonts at different tacking setting until you found the right one. Being Basis Grotesque -10VN. 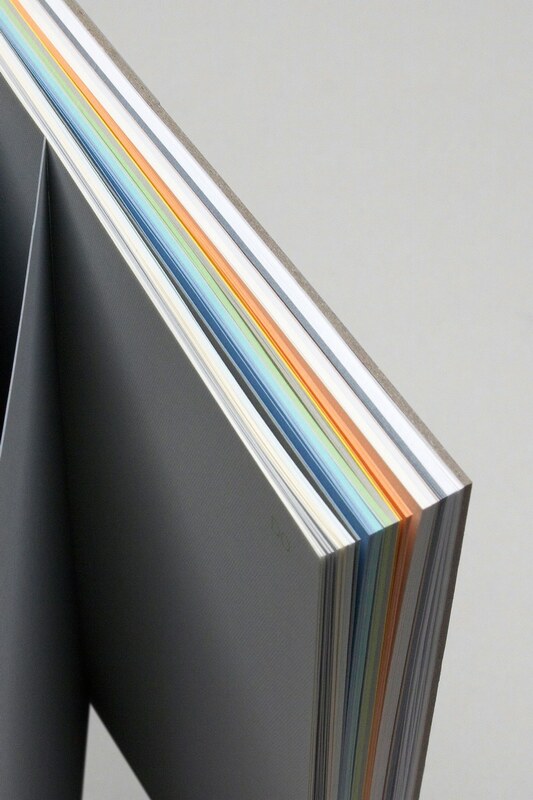 We then spoke about paper stock for the book. For this for the off set of this project I knew that I wanted to use both coated and uncoated paper stocks. As I wanted to use the coated paper stock to highlight the class of 2019 and @dad_rave section. Also for the rest of the book I wanted to use duo tone on uncoated. So we started looking through swatch and got a few quotes. For this it need to be 16 32 16 dps witch meant a quick re-shuffle of the flat plan to make it fit. For the cover I wanted to use something a bit more unique to stand out the rest of the publication at will be at events that course was attending. The two options I picked for this was Gmund Action blue by GFSmith that was slightly reflective and then a holographic foil. Now that we had every thing in place we went back a forward with about 10 proof till we got it right to get it ready to be sent to print. Unfortunately I could’t get it printed as I wanted for this submission. As the printer we’re getting it done with would have taken too long to produces the final outcome. So I had to get a digital print for now and aim to at least get a dummy made up. Witch unfortunately came a day late for submission.